"Sometimes the search for the truth results in more questions." Sony has put out another new international trailer for the film Searching, from writer/director Aneesh Chaganty, the emotional thriller that takes place entirely on computer screens. This premiered at the Sundance Film Festival under the title Search, and was one of my favorite films of the festival. 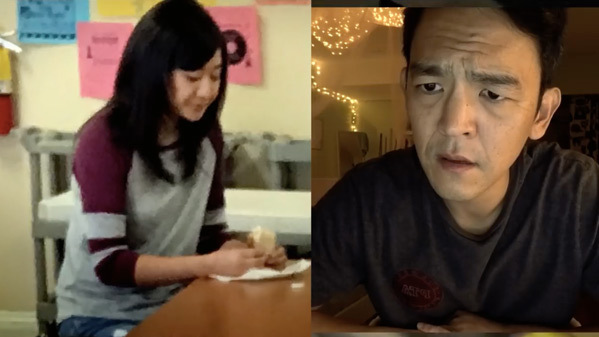 John Cho stars as the father of a young Korean-American teenager who goes missing, and he frantically searches through her computer and phone in an attempt to find her. The film's small cast includes Debra Messing, Michele La, and Joseph Lee. This is the best computer screen film to date, and it shows the potential for truly authentic and meaningful storytelling using this technique. I'm a very, very big fan of this film and will keep telling everyone to go see it, because it is way better than you're probably expecting. This trailer reveals a lot - potentially too much, so be careful. You can still watch the first full US trailer for Chaganty's Searching here, for more footage from this. After David Kim (John Cho)'s 16-year-old daughter goes missing, a local investigation is opened and a detective is assigned to the case. But 37 hours later and without a single lead, David decides to search the one place no one has looked yet, where all secrets are kept today: his daughter's laptop. In a hyper-modern thriller told via the technology devices we use every day to communicate, David must trace his daughter's digital footprints before she disappears forever… Searching is directed by up-and-coming filmmaker Aneesh Chaganty, making his feature directorial debut after working for Google and making a few short films previously. The screenplay is written by Aneesh Chaganty and Sev Ohanian. This first premiered at the Sundance Film Festival earlier this year (read our review). Sony's Screen Gems will release Chaganty's Searching in select theaters starting on August 3rd this summer. First impression? Who's in?